Well over a century ago - in 1839 - a young American named David Haviland, then living in New York, was engaged in the retail china business in that city. To his shop came many of New York’s prominent families to choose the china—that with great talent and interest—he was importing from England. The young importer was happy in the growth of his business and in the satisfaction of his customers in owning the china that his zeal and good taste enabled him to offer them from abroad. But one day his shop door opened and a customer came in carrying a small package that was not only to change David Haviland's life, but was to have a profound effect on the whole china industry and on the china ware in thousands of American homes. The one little package seemed insignificant enough, it held only a broken cup that its owner wanted replaced. As Mr. Haviland took the cup in his hands, he began to be impressed by it. He could tell at once that it had come from France. But from what part of France? Which of the French potteries had turned out this piece of porcelain? Examine it as he did, the cup had absolutely no mark of identification. Familiar with imported china as he was, the cup baffled him. He had not the slightest notion of its source. As he continued to turn it around in his fingers the quality and beauty of the cup’s translucent china still struck him. Although he had shaken his head and told his customer he could not replace it, he knew that the little piece of porcelain interested him deeply - and that his quest had already begun. Once David Haviland had seen the cup there was nothing to do but go in search of it. He knew crossing the Atlantic at that time was a long and tedious voyage of several weeks. But he was determined to go to France to find the match - and more - of this unique china, and to be the first to introduce the ware to America. Once in France there were many leads to follow up, many blind alleys, many disappointments. A less determined man, and one less impressed with the quality of the ware, might have given up and gone home. Mr. Haviland did not-and his romantic and obstinate search was rewarded. He came finally to the city of Limoges, where for seventy-five years china had been manufactured, and where he found the match of his cup. That this china was made in Limoges was no accident. In 1765, in the quaint nearby town of St. Yriex, kaolin had been found. Kaolin is a very pure white clay known from time immemorial in China, that had enabled Chinese artisans through the centuries to make their rare and marvelous pottery. With excitement, satisfaction, and high hopes David Haviland arranged to export his long sought French china so that he could supply it in New York. When he came home he was full of energy and good spirits. He had realized his ambition, and he was now to offer this ware to Americans for the first time. It was from Limoges, then, that David Haviland began importing this fine French china. Unfortunately, however, his pleasure in realizing an ambition was to be short lived. New difficulties soon beset his path due to wide divergence between the French and American taste and requirements. French manufacturers whose factories were of limited capacity were unwilling to make American shapes and decorations. So David Haviland, loath to accept defeat, decided upon a bold step. He resolved to move to France, build a factory in Limoges, and there make china in accordance with his own ideas. In the city of Limoges, David Haviland first set about creating models of the kinds of china dinnerware services he wanted to make, and while these were being developed, he built and organized his own decorating shops. Here he installed everything necessary to change the china from plain to decorated ware. This was a radical step because up to that time Limoges manufacturers had made only plain ware and had sent it to Paris for decoration. It was not easy sailing, for while Americans were to welcome the result of these innovations, the French artisans who were to accomplish them rebelled at the change. Accustomed to their own types of decorations, they staged demonstrations of protest when they saw apprentices being shown how to work out American styles of patterns. Teachers and apprentices often had to go about in groups to protect themselves from attack by decorators who were addicted to old routines and didn’t want to change. Gradually difficulties were smoothed out and David Haviland’s venture was established. On a momentous day in 1842 the first shipment of Haviland china was exported to the United States. Its success was immediate and all the Haviland hopes were justified when the new factory began to produce china in larger quantities than had ever before been attempted in Limoges. Throughout the next years the Haviland factories devoted themselves to the production of functional china that continued to have extraordinary success. At the same time experimental work went on with ever higher standards of artistry and craftsmanship as its goals. When in 1873, three Frenchmen originated an important new process of decorating china, David Haviland was quick to realize its merits and with the resources at his command he considerably improved it. He engaged famous artists of their day and encouraged them to use their talents to make this new decorating a memorable achievement. Other experiments were successful, too, and it was the Havilands who introduced chromo lithographic decorations on porcelain, a method afterwards followed by practically every china manufacturer in the world. In the meantime, David Haviland’s son Theodore followed in his father’s steps. 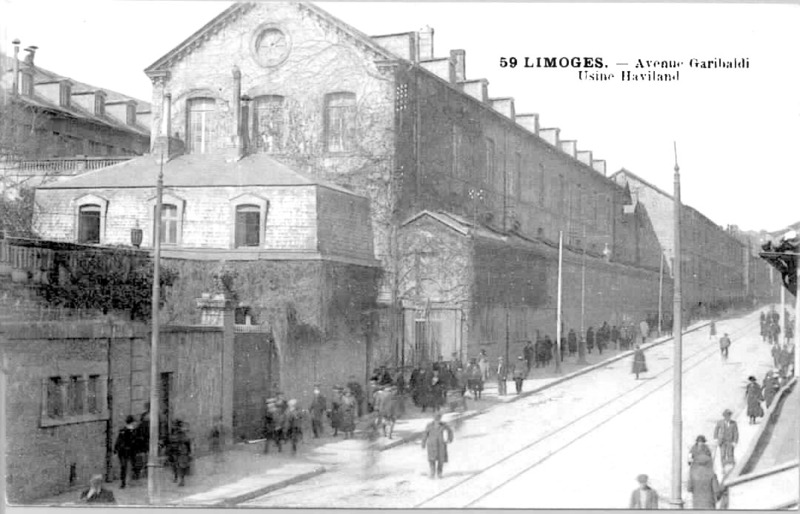 Shortly after 1890 Theodore Haviland built one of the largest and best factories in Limoges, and introduced every new method in machinery decorating, and firing. Skilful French china makers were placed in charge of manufacturing, great ceramic artists headed the decorating departments. Inheriting his father’s genius and enterprise, Theodore Haviland rapidly became a leader in the making of fine china. Almost one hundred years after David Haviland had established the first French factory, his grandson William D. Haviland, decided on another far-reaching step. It was in 1936 that he felt certain shapes and decorations might be made in America and to that effect he put all the Haviland energies to producing a truly fine domestic dinnerware. From the start authorities agreed that the domestic line was thoroughly worthy of the famous Haviland name and consumers who eagerly bought it gave it their wholehearted approval. Today American made Haviland is a leading domestic china. A few years after the end of World War II and under the leadership of David’s great-grandson and the son of William, Theodore Haviland 2nd undertook to completely modernize the factory in Limoges. New kilns, fired by gas, greatly improve the quality of the ware. Electric, electronically controlled decorating kilns assure an evenness of color never before possible. New decorating processes make it possible to make the intricate patterns that have made Haviland world famous at a cost which otherwise would be prohibitive. 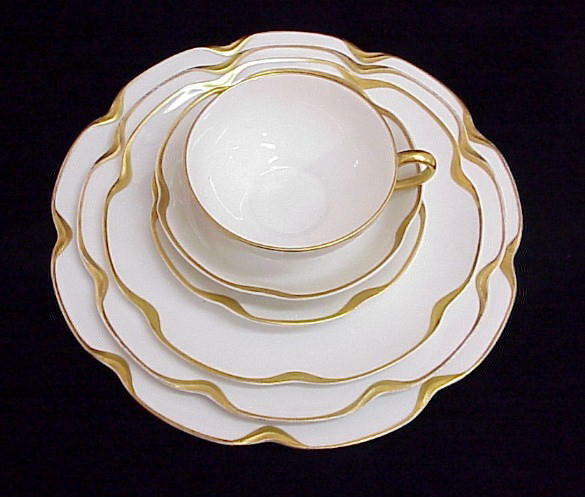 These improvements have enabled the factory to enlarge its scope beyond the manufacture of dinnerware, and in 1961 Haviland introduced a new line of giftware which was immediately recognized as one of the most distinctive on the market. The four generations of Havilands, who have guided the destinies of this world famous institution, have had but one thing in mind; the very best quality, the very best artistic achievement. All pictures and content are copyrighted and are not to be used elsewhere unless permission received. Copyright © 2000-2015 by Haviland Online. All rights reserved.